Mo’s Hut: Is there a new king in the Hawaiian food scene? – Wichita By E.B. Home Asian Mo’s Hut: Is there a new king in the Hawaiian food scene? 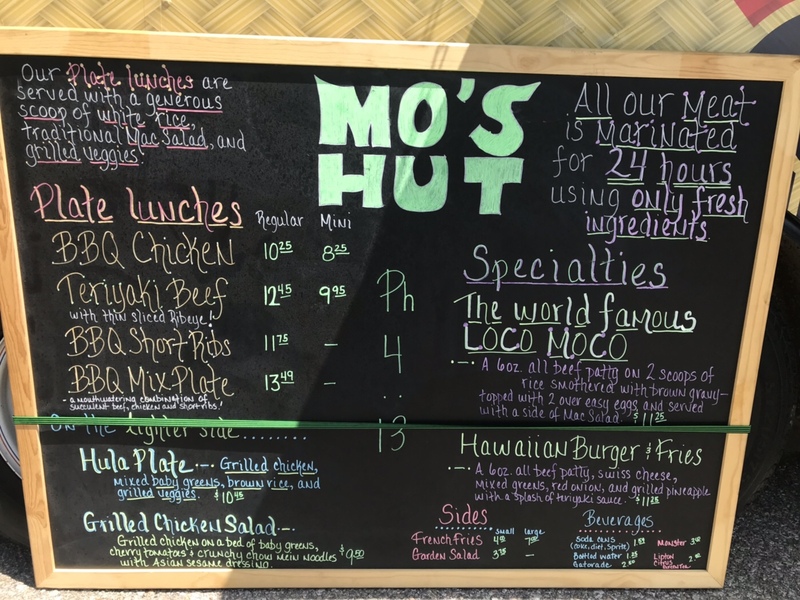 Mo’s Hut: Is there a new king in the Hawaiian food scene? 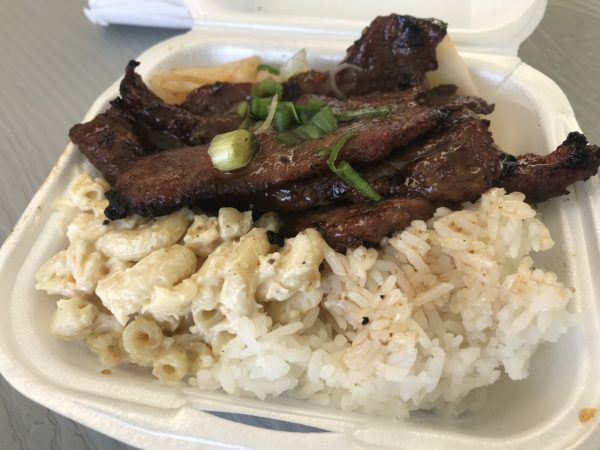 This month a new food truck arrived to the scene billing themselves as one that serves Hawaiian BBQ. 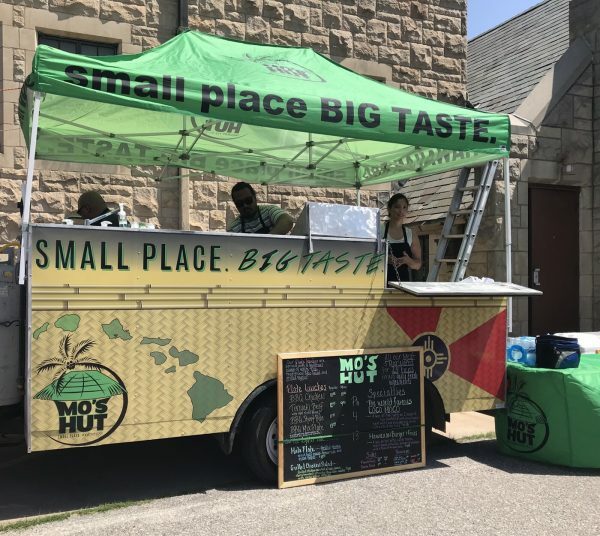 They are Mo’s Hut and can be found every Monday at 445 M. Market right across the street from the downtown YMCA from 11am to 2pm. My friend and I stopped by this week to give them a try while my colleagues ordered carry out. The menu at Mo’s Hut is very simple. It’s a lot of different BBQ options from chicken to beef to ribs. 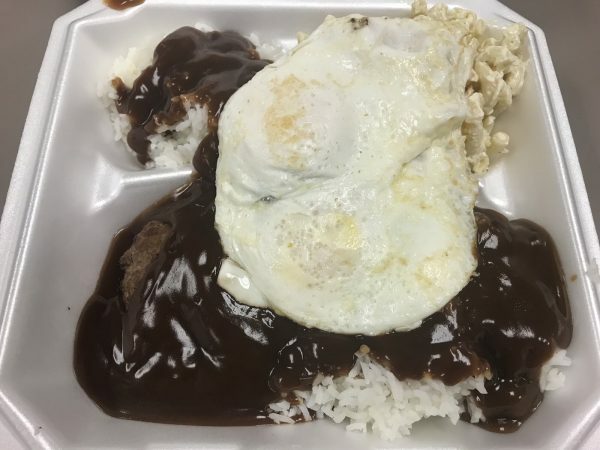 Then you have their Hawaiian burger and fries along with their world famous Loco Moco which is an extremely popular dish at any Hawaiian restaurant. My friend and I decided to dine outside there in the brutal heat. I’m not sure what we were thinking, don’t ask. They had a few tables set up with a large tarp to give everybody some shade at least. I went with the Hawaiian burger and fries while my friend went with the mini teriyaki beef plate. The burger was outstanding. 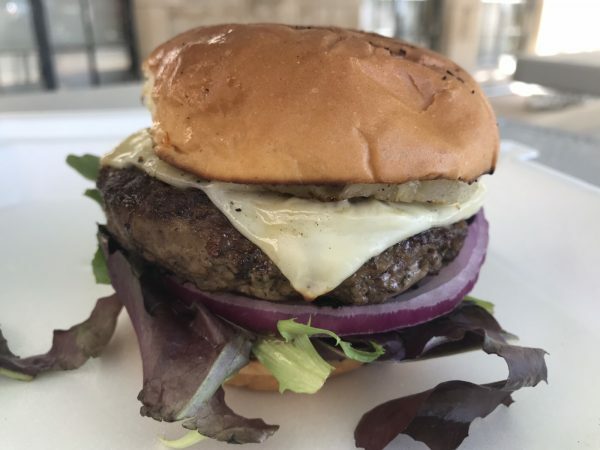 It was everything you wanted in a good burger; it was tender, juicy and delicious. If you’re worried about a pineapple being on the burger, don’t be. I could barely taste the pineapple. All the flavors combined so well together with not one overpowering the burger. 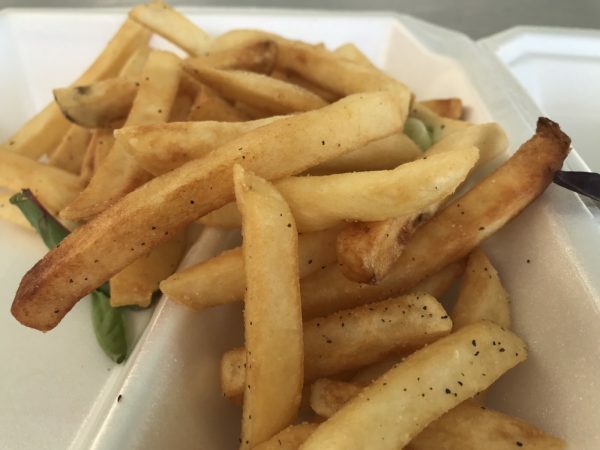 The fries were somewhat seasoned but otherwise nothing to write home about. My friend enjoyed her mini teriyaki beef plate. She said while the beef was a bit tough, it was very flavorful. She followed it up with a big “Wooooooooooo!” or maybe it was just the heat that made me randomly hear things. 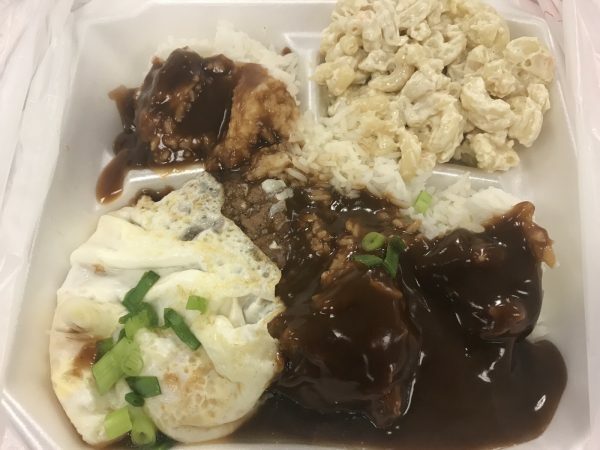 My colleagues went with three orders of loco moco and another went with the BBQ mix plate which included all of the meats. One of my colleagues literally just spent some time in Hawaii and said his loco moco was comparable to what he had while on vacation. All three people, in fact, loved their meal. It looked incredibly daunting and something that would knock you out for the entire day but that wasn’t the case for them; granted a couple of them saved half of it for dinner later due to the huge portion size. The gravy was delicious and not too salty and any meal involving an egg is a big win. As for the BBQ mix plate, the short ribs was the one letdown according to my colleague. She said the rest of it was meats were fantastic. I was able to try some of it and the chicken and beef were my two favorites. The marinade on the meats really gave the dish this “big taste” that Mo’s Hut prides themselves on. 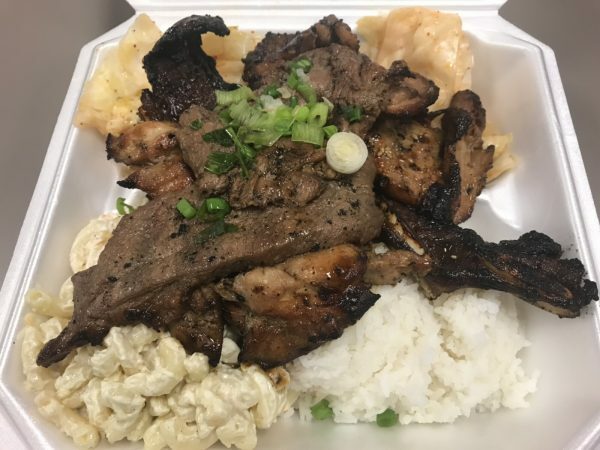 After finishing their meals, three of my colleagues who’ve been to all the other staples around town said this was their favorite Hawaiian food they’ve had so far in Wichita. I actually felt the same way too with everything I tried. That’s a bold statement too given the quality of great Hawaiian food we have here in Wichita. What blew me away as well was the great customer service. The entire staff there was friendly and best of all humble. For a food truck, the food came out in great time. It wasn’t the long long long long waits you see at some of the trucks. Mo’s Hut is a huge win for the food truck scene in Wichita. Give these guys a try soon!